Thirty-five years ago today, the Wonderful World Of Disney aired “Halloween Hall O’ Fame” starring one of my favorite comedians, Jonathan Winters! 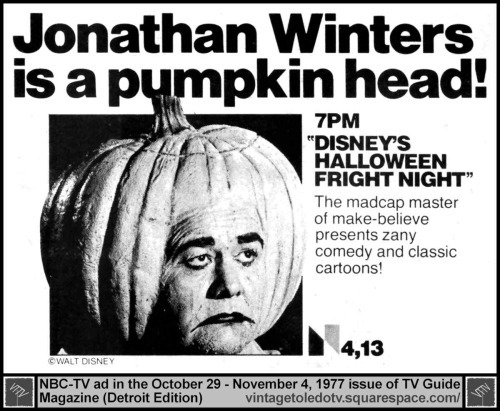 Winters plays a night watchman at Walt Disney Productions and a pumpkin head named Jack O. Lantern (who appears in a crystal ball much like Madam Leota). The special features clips of several Disney Halloween Cartoons: Trick Or Treat, Pluto’s Judgment and The Legend of Sleepy Hollow from The Adventures of Ichabod and Mr. Toad. Here’s the episode in 6 parts! This entry was posted in cartoon, Gothic Disney, Wonderful World Of Disney and tagged Halloween Hall O' Fame, Jonathan Winters, Legend of Sleepy Hollow, The Adventures of Ichabod and Mr. Toad, Walt Disney Pictures. Bookmark the permalink.